This set of practical information "shows the compilation of current sea uses, identifies potential conflicts & synergies as well as MSP related strategic targets and describes the efforts undertaken towards raising the general public awareness – all activities meant to smoothen the upcoming planning procedures expected to start by 2012. This MSP exercise took place within the context of BaltSeaPlan (2009-2012). The Coastal Research and Planning Institute of Klaipeda University (KU CORPI) and the Baltic Environmental Forum (BEF) Lithuania, which represented Lithuania in the BaltSeaPlan project, led the process that tested how MSP could be carried out in Lithuania. As an MSP exercise, it is not legally binding. The MSP exercise developed within BaltSeaPlan resulted in a statutory MSP process. The MSP exercise covers the maritime area of Lithuania; an area of not more than 7000 km2 that borders with Latvia, Russia and Sweden. This relatively small area hosts multiple uses, including ports and marinas, oil terminals, offshore military polygons, areas reserved for offshore wind energy and sand extraction, fisheries, Natura 2000 sites, etc. The main detests and the need for MSP were identified during the implementation of Interreg IIIa Neghbouring Program between Lithuania, Poland and Russia project – POWER “Perspectives of Offshore Wind Energy development in marine areas of Lithuania, Poland and Russia”. The project that was initiated in order to foster the development of the OWE business in the South Eastern Baltics. 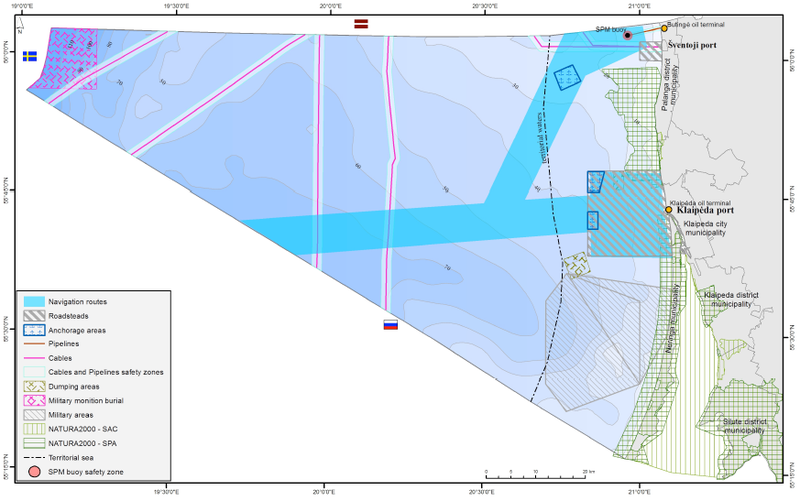 By stocktaking the existing uses and trying to predict the potential conflicts with other sectors, project t partners made the initial stocktake of the Polish, Lithuanian and Russian (Kaliningrad Oblast’) marine areas. Recognizing the urgent need to address the growing demand for maritime space through comprehensive maritime spatial planning and proper management, this MSP exercise focused on the development of the purposive scheme of MSP and the implementation of relevant actions (e.g. identification of potential conflicts and synergies, assessment of the national legal framework and identification of MSP related strategic targets), as well as raising public awareness. The Maritime Spatial Plan of Lithuanian Sea was not the subject of the particular exercise. Therefore, no specific uses were designated. The aim of the project was to create the preconditions for consolidating national MSP actors through the exploratory analysis of stakeholder priorities, public awareness raising, education and consultations. An extensive list of stakeholders was developed during the project and a mix of various participation techniques was employed ranging from one-way information tools (publications, web material) to target general audience at the early stages of the exercise to interactive involvement techniques (public talks, roundtables discussions, surveys) at later stages. No transboundary consultation took place within the framework of this MSP exercise.